Protein for weight loss… how much do you need? 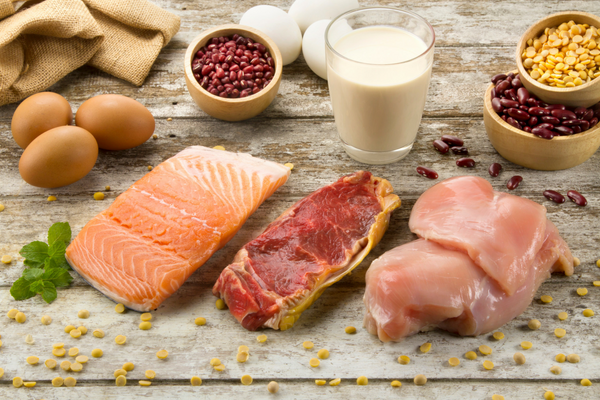 How much protein do you need to maintain performance and muscle mass during weight loss? It is often necessary for athletes or those undertaking high levels of exercise or training to lose weight, whether that be for optimal body composition, aesthetics, requirements of the sport or weight gain over the off-season. It is also desirable to be able to maintain performance and training at optimal levels during weight loss, to maintain muscle mass and to prevent injury. To do this we need to consider the amount of protein that will give us high quality weight loss while enabling the individual to continue to perform at their best. For health, we require 0.8g protein per kg per day, which for example means a 70kg person requires 56g of protein a day to meet general requirements. However, protein requirements during calorie restriction are much higher in this group of people. Studies show they need somewhere between 1.6-2.4g per kg body weight per day (1) – so the same 70kg person is looking at 112-168g protein per day. Now, the total amount of protein is not the only consideration we need to make. Our bodies can only use 20-30g protein for muscle repair and synthesis every 3-4 hours. So, it is unhelpful to consume more than 100g of protein at once. Instead, it is best to spread protein intake evenly throughout the day, making sure each meal and snack contains 20-30g of high quality protein in order to meet their individual protein requirements. Another key time point to consume adequate protein is in the hour or two after training or exercise, particularly resistance exercise, when the rates of muscle protein synthesis are higher. This will ensure you are meeting your protein requirements necessary for good quality weight loss, or in other words body fat loss rather than muscle mass loss. If you are unsure about how much protein you should be eating or would like further advice about weight loss, feel free to book in with one of the Accredited Practising Dietitians at Peninsula Physical Health and Nutrition (PPN). Hector, A.J., Phillips, S.M. (2018). Protein Recommendations fr Weight Loss in Elite Athletes: A Focus on Body Composition and Performance, Int J Sport Nutr Exerc Metab, 28, 2, 1701-77.